"Always hail, ever conceal, and never reveal our little senseless secrets." Masonic Hand Book, p. 74. 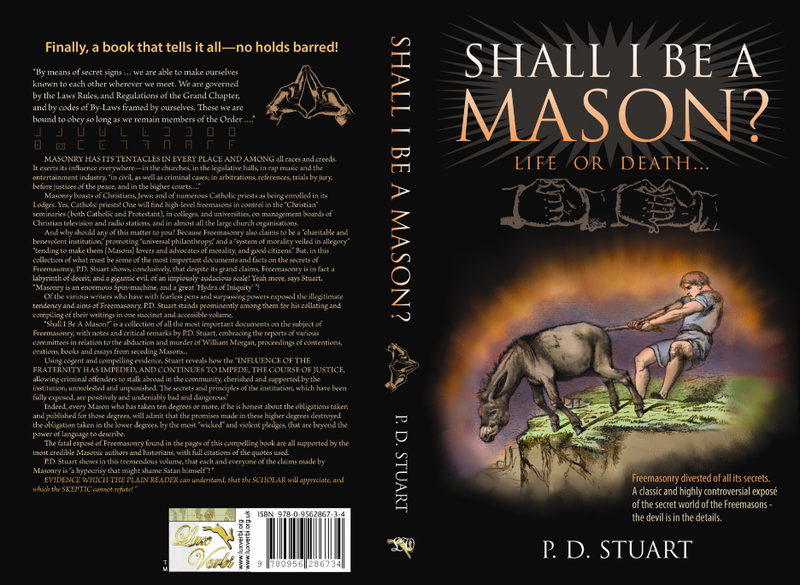 Lux-Verbi is pleased to announce the RELEASE of "Shall I Be a Mason?...". (Published November 3, 2014)! . Masonry boasts of Christians, Jews; and of numerous Catholic priests as being enrolled in its Lodges. Yes, Catholic priests! One will find high-level freemasons in control in the “Christian” seminaries (both Catholic and Protestant), in colleges, and universities, on management boards of Christian television and radio stations, and in almost all the large church organisations. P.D. 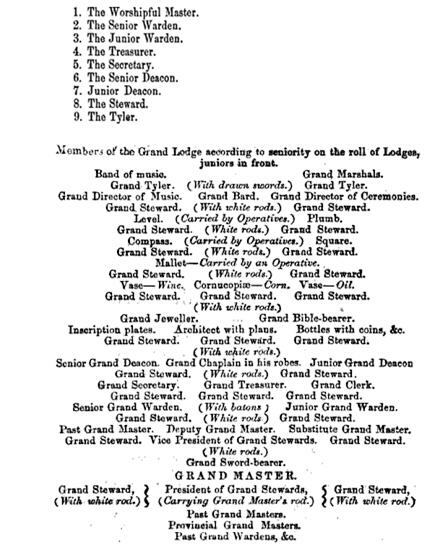 Stuart writes, "By its own self-definition—if we took seriously the grandiose titles arrogated to its officers and honourees—Freemasonry is indeed a most grand organisation, with its GRAND WARDENS, GRAND TREASURER, GRAND SECRETARY, GRAND CLERK, GRAND CHAPLAINS, GRAND DEACONS, GRAND STEWARDS, GRAND ARCHITECT, GRAND JEWELLER, GRAND BIBLE-BEARER, GRAND DIRECTOR OF CEREMONIES, GRAND BARD, GRAND SWORD-BEARER, GRAND DIRECTOR OF MUSIC, GRAND MARSHALS, GRAND TYLER, GRAND COMMITTEE, PAST GRAND MASTER, PAST GRAND DEPUTE MASTER, AND PAST GRAND SUBSTITUTE MASTER, PRESIDENT OF BOARD OF GRAND; GRAND PONTIFF, and many other Masonic GRAND HONOURS and GRANDEES; and of course, the ILLUSTRIOUS GRAND LODGE and its MOST WORSHIPFUL GRAND MASTER." Freemasonry also makes other GRAND claims, not least, to being a “charitable and benevolent institution,” promoting “universal philanthropy,” and a “system of morality veiled in allegory” “tending to make them [Masons] lovers and advocates of morality, and good citizens.” But, in this collection of what must be some of the most important documents and facts on the secrets of Freemasonry, P.D. Stuart shows, conclusively, that despite its grand claims, Freemasonry is in fact a labyrinth of deceit, and a gigantic evil, of an impiously-audacious scale! Yeah more, says Stuart, “Masonry is an enormous spin-machine, and a “great ‘Hydra of Iniquity’”! Says, Stuart, ‘No man unites with Freemasonry to increase his piety or usefulness to society by such membership! Nor is any one required by the Masonic Order to live up to such expectations. It is FOR HIS TEMPORAL BENEFIT THAT A MAN UNITES with the Order,’ WHETHER IT BE SOCIAL, POLITICAL, FINANCIAL OR MATERIAL. The use, by the Order, of names of ‘divinity,’ and its claims to ‘antiquity,’ ‘morality,’ ‘benevolence’ and ‘religion,’ are gross misnomers, the mere tinsel of attraction: ‘bogus,’ all! In Shall I Be a Mason?... Life or Death, proof will be provided of sworn court testimonies from respected Freemasons who affirm masonic murders do occur, with either the direct involvement or approbation of the Lodge. Such proof will come from no less than the Legislative Investigation into Masonry-- an examination, under oath of more than fifty adhering and seceding Masons, before a Committee of the General Assembly of Rhode-Island, held at Newport, between December 7, 1831 and January 7, 1832. And that at is not all! 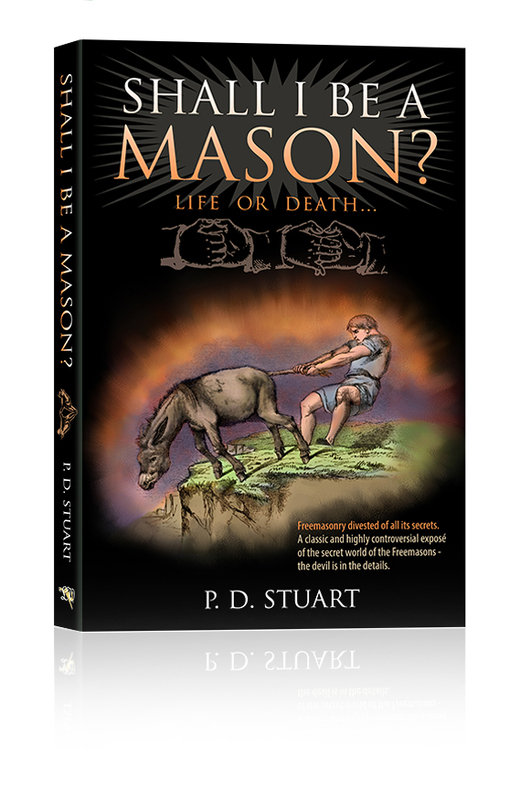 Even more alarming facts are revealed in "Shall I Be A Mason?" In this work, P.D. Stuart combines scholarly research and compelling storytelling in tracing Freemasonry as a worldwide political, religious, economic and social body, outwardly dedicated to ‘self-improvement’ and ‘charitable’ causes, but governed by sinister secret rituals and using signs (explained in detail) to identify each other for largely lawless purposes. But as P.D. Stuart likes to say, Veritas Temporis filia (“Truth is the daughter of Time”). That time has arrived! And from this fatal exposé may Freemasonry never recover. There is now ‘no help for the widow’s sons.’ “Mah ! Hah ! Bone!”° He that hath an ear to hear, let him hear! EVIDENCE WHICH THE PLAIN READER can understand, that the SCHOLAR will appreciate, and which the SKEPTIC cannot refute! OR "Freemasonry divested of all its secrets!" 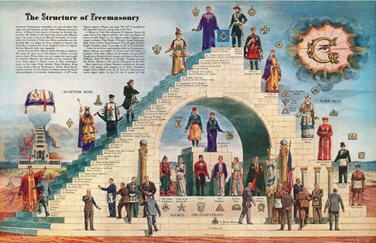 SHALL I BE A MASON?—Life or Death, OR "Freemasonry divested of all its secrets!" . IMPORTANT NOTICE: For all ORDERS OF LESS THAN 5 COPIES to be delivered outside of the USA, please order using this "Add to Cart" on the right. DO NOT USE ANY OTHER BUTTON AS YOUR ORDER WILL BE REFUNDED. ·To Order single copies FOR DELIVERY WITHIN THE USA: see options after the first six "Add to Cart" buttons below. 5-9 copies; Update/change the qty in shopping cart. 10-19 copies; Update/change the qty in shopping cart. 20-39 copies; Update/change the qty in shopping cart. 40-49 copies; Update/change the qty in shopping cart. 50-99 copies; Update/change the qty in shopping cart. "Here, P.D. Stuart takes a fresh look at the origins of Freemasonry and emerges with something really new, something truly worth the attention of every thinking man, woman, teenage boy and girl. The work of Abbe Barruel, and Professor Robison’s Proofs of a Conspiracy to overthrow all Religion and Government, present a faithful and alarming picture of Freemasonry, and commend themselves to the deliberate consideration of thinking people. We see nothing today to doubt the opinion of Mr. Odiorne. Indeed, every mason who has taken ten degrees or more, if he is honest about the obligations taken and published for those degrees, will admit that the promises made in these higher degrees destroyed the obligation taken in the lower degrees, by the most “wicked” and violent pledges, that are beyond the power of language to describe. P.D. Stuart persuasively links Freemasonry's origins and goals, not just to the once powerful and wealthy Knights Templar but to the Middle East, namely Syria, Babylon and Egypt. The author combines scholarly research and compelling storytelling in tracing Freemasonry as a worldwide political, religious, economic and social body, outwardly dedicated to ‘self-improvement’ and ‘charitable’ causes, but governed by sinister secret rituals and using signs (explained here in detail) to identify each other for largely lawless purposes. Many Masonic individuals will claim the information on Freemasonry in this book to be inaccurate. But the fatal exposé of Freemasonry found in the pages of this volume are all supported by the most credible Masonic authors and historians, with full citations of the quotes used. Yet, Freemasonry and its supporters insist that masonry is entirely and solely aimed at charitable objectives. But, as P.D. Stuart shows in this tremendous volume, that claim by masonry is “a hypocrisy that might shame Satan himself”! What does the author mean by all of this? In the pages of this book the reader shall have amble cause to see. ~ Savanarola La Maître, Louis de Montalte, and Philippe le Bel, Editors, July 13, 2014. James Creighton Odiorne, Opinions on speculative masonry: relative to its origin, nature…. (Boston: Perkins & Marvin, 1830), p. 171. 1. Catholic church and world politics. 2. Recessions. interpretation, etc. 6. Financial crises. I. Title II. Series III. La Maitre, Savanarola. IV. Montalte, L. de. V. Le Bel, Philippe. Special Offer - Customers who ordered Codeword Barbelon (Bks 1 & 2) will also be interested in the DVDs series: "REKINDLING THE REFORMATION", by Walter Veith. 11 lectures on 4 DVD discs, more than 7 hours. Plus, FREE book on the Jesuits' and the Freemasons' control of America, called "Codeword Barbelon." Reeks in Afrikaans, met 12 lesings. Millions of faithful servants died for pivotal truths found in the Word of God, such as the identity of the Antichrist and salvation by grace alone. Their sacrifice succeeded in subduing an empire and making freedom of religion and thought possible. But, their success was short-lived. Through the centuries since the Reformation, we have lost the beliefs the reformers stood for. We have allowed God’s truth to be mixed with error. Today, we reap the repercussions of our lethargic neglect. The Roman Empire’s wound is healed, and politicians and heads of state follow without reluctance. This series is not a history lesson. It is a call to rekindle the principles of the Reformation and to re-examine the fundamental truths upon which the Reformers such as Calvin, Luther, and Zwingli stood. Dr. Veith presents clear insight into the underlying objectives of today’s political, economic, and religious maneuverings. He explains why we may have to fight the battle of the Reformation all over again. Will you know the issues and understand the enemies’ tactics enough to resist error? This series will help equip you.